40 Paddles…A short music video | Vermont Paddle Pups! We probably will not get out again this season….temperatures are plummeting, and the forecast is for snow. Water temps are down to around 50 degrees, and without dry suits, it would be a “Terrible, Horrible, No Good, Very Bad Day” should we go over. 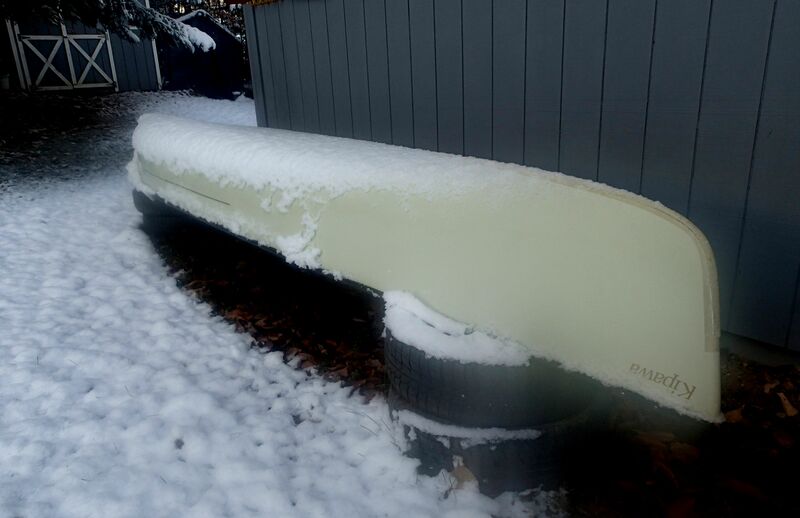 So, we prep the boat for it’s winter storage ( NuFinish the hull, Tung Oil the wood, remove float plugs, etc), and present a short video…one picture from each of our 40 canoe journeys this year. We canoed on 11 new ( to us) bodies of water, and found some new favorites among that group. We’re now getting into winter mode, and the fun we’ll have dealing with whatever Mother Nature brings us this year! ← Stick Season…Stuck with it! Our water fun season is over too. I ordered to paddleboards (that we are still waiting for) but it will be too cold to use them by the time they arrive. At least we will be prepared early for next year. Yes,having something to look forward to helps get through the long winter!